The center capacitor is the replacement capacitor I used and the other four are the originals. 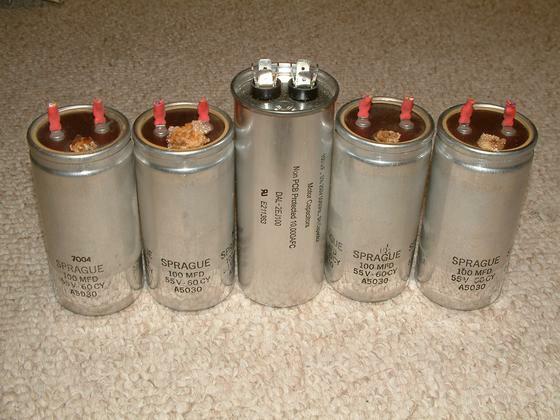 The original capacitors are non polarized electrolytic Sprague 100 micro farad 55V 60 Cycle AC capacitors A5030. Capacitors with similar ratings do not appear to be available. To replace them I used AC motor run capacitor DAL-2EJ100 that I found on sale from Capacitor Industries. They were a good price but had a 50 piece minimum order. I found enough other people with the same problem to make it a good deal. These are oil filled capacitors and a better than the original electrolytic. They are slightly smaller in diameter and about an inch longer. The other option is a motor start capacitors which are similar electrolytic but are rated for short term operation while a motor starts. The data sheets don't give sufficient information to tell if they will be reliable in this application of continuous duty at a much lower voltage.